Score the inside of the squids and cut into thick slices. 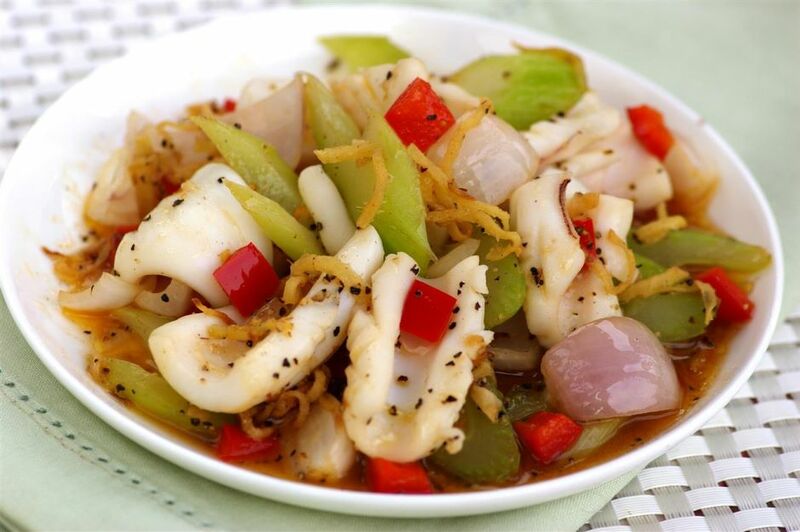 Lightly season squids with a little salt and pepper and leave for 10 to 15 minutes. Blanch the squids in boiling water for 30 to 40 seconds. Dish out and drain well. Heat sesame oil in a wok and fry garlic and shallots until lightly golden. Add ginger and celery. Stir-fry briefly. Add sauce ingredients and bring to a brief boil. Once the sauce starts to thicken, add squids, capsicum and onion. Toss briskly to combine. Sprinkle in coarsely ground black pepper. Dish out onto a serving dish.